Well it finally happened. There's a Johnson Loader in my shop just waiting to be mounted up to my 110. At the moment I have two 1964 round fenders, one that I am restoring and one that I can use, not restored. If it wasn't for forums like this I wouldn't even know that they even made a FEL for this tractor. So after extensive searching and patience I was able to make a deal happen on craigslist. So I wanted to share my project the best I can also. I am pretty sure I have all the parts I need except for some bolt and maybe some pins. It also looks like I may have too replace some hydraulic hoses right off the bat too. Not really sure how the ballast box is supposed to bolt up either, but I'm sure that will the least of my worries. Are there any issues installing this onto a 64 110? Most loaders I have seen, have been on 112's with 10hp motors and 5 bolt hubs. 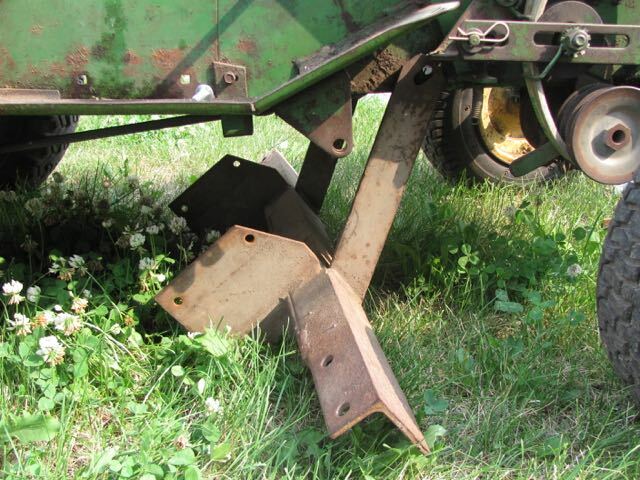 What was the original color of this loader? previous owner said it was a goldish/yellow. I've seen some that were white. This will be a slow project as I have been working all the time lately, but any help or input is greatly appreciated! Last edited by oaks1450; 11-10-2018 at 01:11 PM. Nice.....kind of interesting how that big bucket attaches to the smaller one. 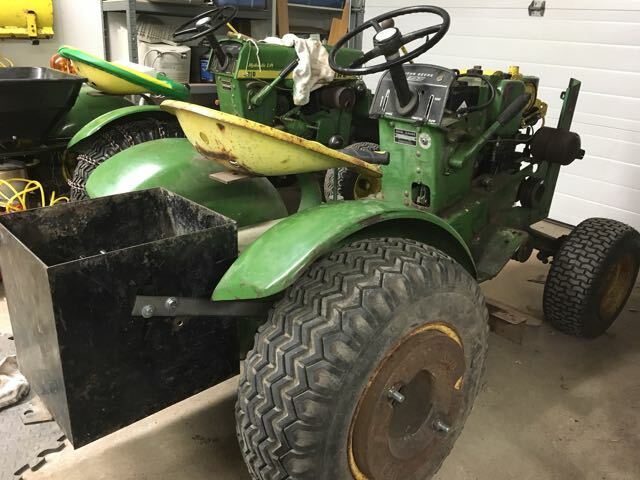 So, the biggest problem you'll have mounting the Johnson 10 to a '64, I figure, is going to be the fact that you'll have to pull your footrests and space them out so you can fit the rear mounting frame for the loader onto the tractor. 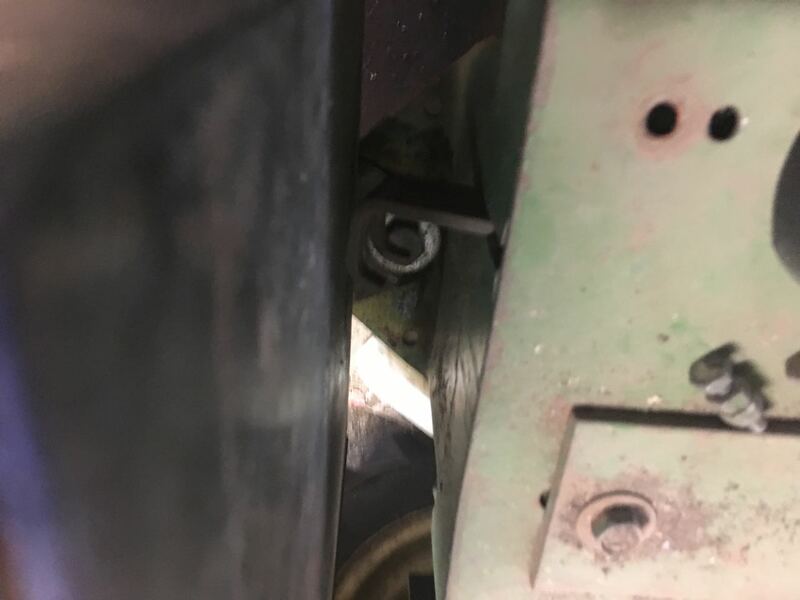 The '67 frame had slots cut for the loader mount... Here's what my '67 112 footrest looks like. So with the slots in there, you can do up the front, then just slide the mount up into the slots and do up the rear carriage bolts. Last edited by littletractorguy; 11-10-2018 at 02:07 PM. Welcome to the Loader Club....... once you've had one, there's no going back to the wheel barrow. I've got a PDF of an original Johnson 10 manual if you think it would help you. It's for a Cub Cadet but it has a lot of specs and pictures in it. Send me a PM with your email address and I will send it to you. Last edited by inspectorudy; 11-10-2018 at 05:07 PM. Good deal I wold love to have a FEL for one of my tractors. Ok thanks Littletratorguy for the info. Guess I’ll have to figure out some sort of spacer for the foot rests. Also nice to see how the ballast box is mounted to you tractor and explains the holes in the side of my box. Took the mower deck off and hangers off the 110 today after work and moved the 318 out to the shed for more room and brought the 110 in. I’m sure power steering would make things easier, but I’m hoping with the size of this loader being so small it’s not such a burden to steer. We’ll see soon enough. Just got done taking off the floor boards and was able to do a temporary mock up with some spare nuts and bolts I had laying around. Plan on getting what you see here bolted up tomorrow after work. Also try and figure out what i’m gonna use for a spacer between the frame and floor boards. Also took off the PTO. I imagine the hydraulic pump bolts up somewhere in this area. 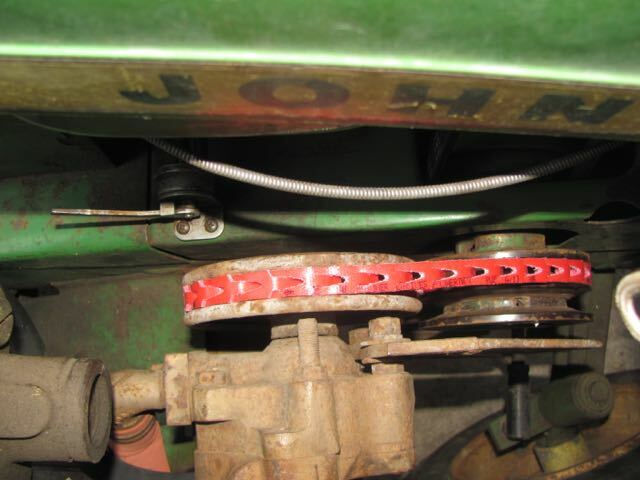 The only downside to installing the Johnson 10 on a '64 is the front axle. It states in the 10 manual that if you are going to install on a '64 that the front axle should be swapped out for the cast axle from the '65-'67. I think in your case it would depend on how you plan to use the loader. Is it more for looks/light duty or are you going to load it to the max every time you use it. I too have a Johnson 10 on my '65 110. It is the original gold color, which you can see if you look at your subframe and pump bracket. It's great you have a ballast box too, my loader didn't come with one but I have the dimensions to make one (thanks LTG). Spacing out the footboards was easy, I bought a strip of 1" x 1/4 flat stock steel and just cut them to length. 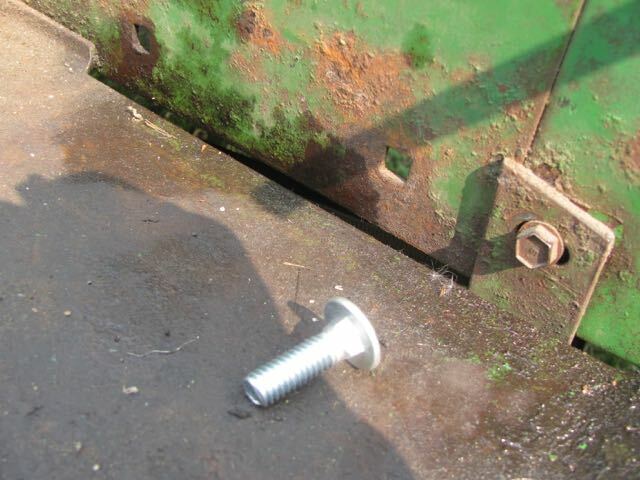 I also replaced all of the carriage bolts since the footboards were now spaced out. Last edited by lotsofspareparts; 11-10-2018 at 08:41 PM. Been reading thru this thread with interest. I don't think anyone has mentioned that the Johnson Workhorse 10 with the single bucket curl cylinder was also known as the Johnson "Midget" Loader. Johnson themselves named it as such and this may help with your searches for pics or info. They later became the Johnson Workhorse 10TC, TC being twin cylinder. Thanks for the pic. I may hit you up later for another pic when I get closer to mounting up the pump. Thanks!